These are just few example reasons that congregants of the Members Church of God International (MCGI) have when offering their thanksgiving to God. In the true congregation of God, members have been taught the virtue of being thankful for whatever blessings and experiences that come in the way of their lives. 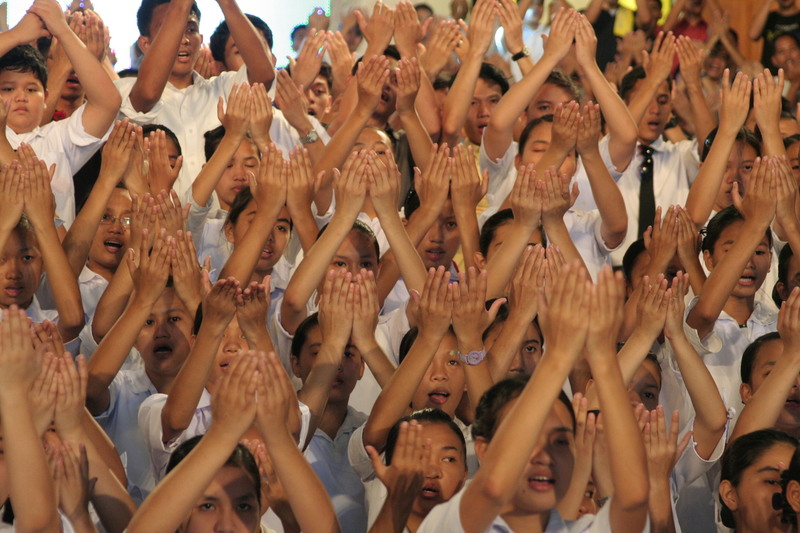 MCGI holds a regular Thanksgiving service every Saturday at around 5 p.m. Since the main headquarter is in the Philippines, majority of the members attend the service at the ADD Convention Center in Apalit, Pampanga. Some major convention and coordinating centers are also open to accommodate brethren and guests. On a quarterly basis, the whole congregation assembles for the three-day Pasalamat ng Katawan or Thanksgiving of the Body. Starting with the congregational singing, which is led by the MCGI Music Ministry, members join in the singing of Church hymns. Along with this part, groups and celebrants offer their Thanksgiving songs on stage. 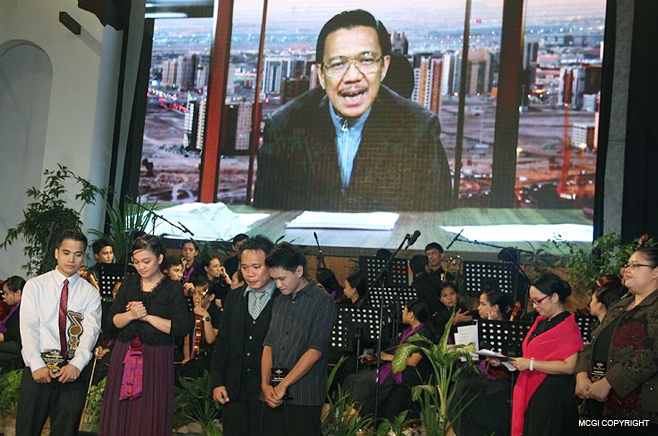 From individuals who experienced God’s saving grace to committees, groups and locales celebrating their anniversary, celebrants first proclaim their reasons before the congregation through pre-recorded videos flashed on big screens. This is followed by the presentation of the newly-baptized and their thanksgiving presentation before the opening prayer. The sermon immediately follows the opening prayer where Bro. Daniel Razon delivers the first half of the topic based on the outline prepared by Bro. Eli Soriano. The Vice-Presiding Minister also gives a few inspirational remarks as well as updates of Church happenings and projects before delivering the topic. After Bro. Daniel delivers the first half of the topic, there is an alloted hour for members to take a break but also the period for members to personally consult their problems to Bro. Eli and Bro Daniel. After the break and consultation session, Bro. Eli finishes the rest of the topic for the day. 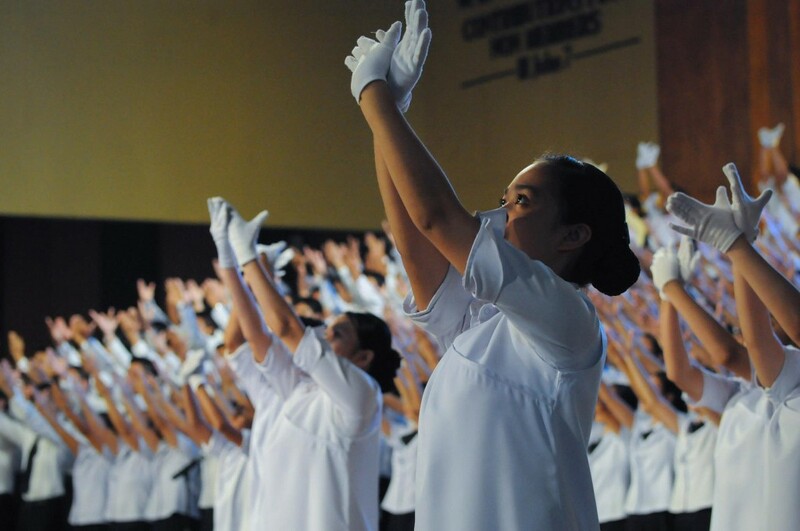 However, whatever the occasion, whatever the reason may be of Church members in their thanksgiving to God, this blog aspires to give a glimpse of the weekly offering of faith and praise to God that MCGI offers weekly. Anecdotes and tales of how offering of thanks positively affect the lives of the Members Church of God International will be featured as well. A member of the Church of God International hands free medicines in a medical outreach with media partner UNTV in 2012. 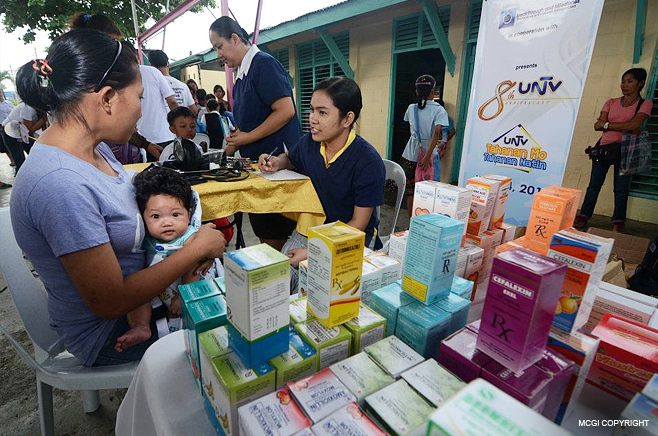 The Members Church of God International (MCGI) is conducting next month its first massive public service event for 2013 dubbed as the Nationwide Simultaneous Medical Mission to be held in over 10 key locations in Luzon, Visayas and Mindanao. Slated on February 24 of current year, the Medical Mission is being undertaken through the ADD Foundation as a yearly public charity commitment of MCGI and Bro. Daniel Razon to the Rotary Club of the Philippines. Bro Daniel, the Vice-Presiding Minister, has been a member of the Rotary Club of Kamuning for several years already. Last year’s Simultaneous Medical Mission had served a total of 14,563 people. Out of the recorded figure, there were 7,872 who received free pedia care and dental care while 6,691 were given free health medications. From last year’s eight selected venues visited by the Medical Mission, including Quezon City, Laguna, Sorsogon, and Iloilo, among others, the activity will extend to two more places. “This year’s medical mission will be even bigger with the addition of minor surgical services,” said ADD Foundation representative, Ms. Cyril Oira. In a 2009 household survey conducted by the World Health Organization (WHO), the average amount of prescription needed to remedy acute illness would already amount to P485 ($11.59) while medicines for chronic diseases would amount to P946 ($22.52). The said amount excludes the extra expenses attached to renting medical equipment, according to the Philippine Daily Inquirer. Mounting bigger, massive medical missions such as this one is only part of the regular medical health services given free by the organization through its charitable arm, Kamanggagawa Foundation and in cooperation with UNTV. The Clinic ni Kuya Daniel stations, whose main clinic is at the UNTV Building, are established in various locations locally. Medical missions last year benefitted more than 170,000 people across the Philippines and abroad. Other public service works being maintained by the ADD Foundation include the Transient Home in Quezon City and Pampanga, blood donation drives where its next massive undertaking will be held in March this year. The year 2012 has been a very fruitful year for the ADD Foundation International, the charity and public service arm of the Members Church of God International (MCGI), after yielding a total of 9,920 blood bags during the course of its year-long mass blood donation drives. In partnership with the Philippine Red Cross (PRC), MCGI through ADD Foundation holds regular blood donation drives and quarterly Mass Bloodletting Drives in different key locations all over the Philippines and abroad. This continuing effort by MCGI is geared at reaching the required daily 2,500 units of blood needed by the PRC. Members of the Church of God International donate blood at a Mass Blood Donation at the Transient Home in Apalit, Pampanga. Out of the total 11,930 blood donors for the full 2012 year, records from the ADD Foundation showed that there were 805 recipients of this effort. 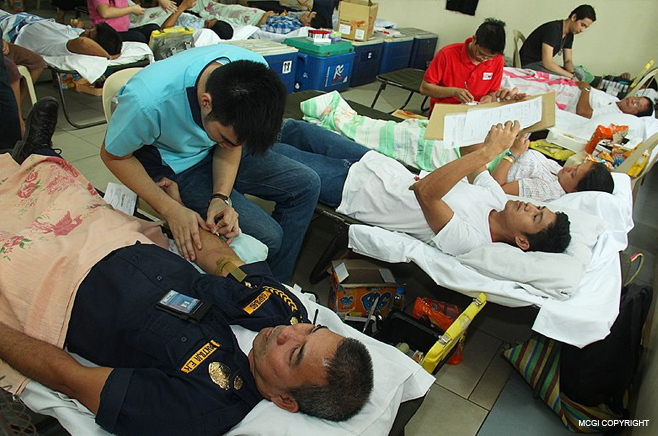 A total of 843 units of blood were given to clients from the Philippine Blood Center (PBC) and PRC, respectively. MCGI’s live donors on the other hand numbered to 362. 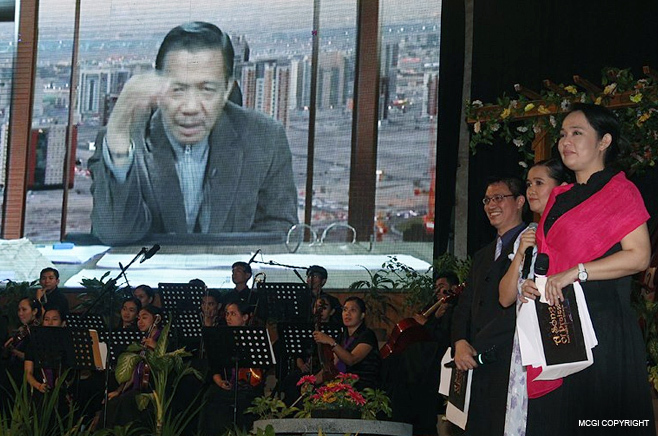 Included in the list of recipients from live donors was the late “Dolphy” Quizon, the Philippines’ Comedy King. A member with a B+ blood type donated blood and plasma to the beloved celebrity in June 2012. For MCGI’s contribution of more than 2,000 bags of blood last year, the Philippine Blood Center honored the Church with the Jose Rizal Award. The award was the highest laurel in the Dugong Bayani Awards 2012, held at the Diamond Hotel last December 17, 2012. MCGI members at Pampanga, Philippines take a seat as they wait for volunteers from the Philippine Blood Center to test their blood for donation. The Philippine Blood Center (PBC), a branch of the Department of Health, is the country’s leading provider of blood collected from volunteer blood donors. The MCGI through ADD Foundation also holds medical missions in various places all over the country. 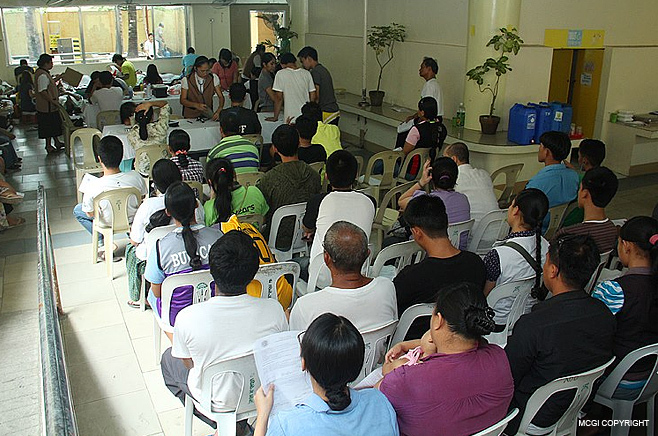 The Church also provides legal assistance to the public and maintains transient homes in Quezon City and Pampanga. 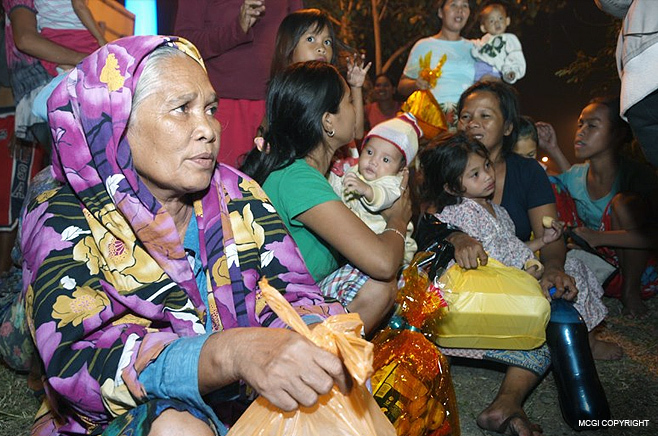 As the rest of the world lit up firecrackers to welcome 2013, the Members Church of God International (MCGI) lit up faces by giving food and money to indigents on the streets. “I’m really happy. It’s my first time to receive such gifts from anyone,” said a recipient living along Taft Avenue in Manila. She and her mother were some of the families helped by MCGI and media network UNTV during the latter’s Repaso 2012 coverage on December 31st. MCGI gave food and money to a woman and her mother roofed by the Light Railway Transit or LRT along Taft Avenue in Manila. Through UNTV News and Rescue teams roving the streets of Manila, MCGI’s food and livelihood giveaways found their way to the hands of poor families and individuals. 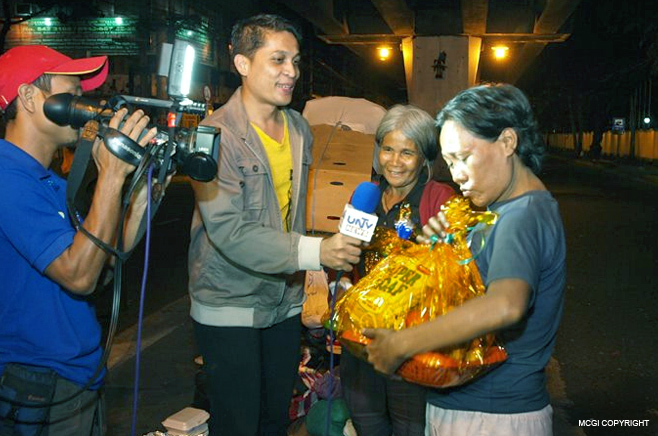 Along Roxas Boulevard, two families sharing a side of the road for shelter thanked UNTV and MCGI Leaders Bro. Eli Soriano and Bro. Daniel Razon for the gifts they received. Seeing however that the said families had little children and infants, Kuya Daniel tasked the UNTV team to bring the indigents to the Clinic ni Kuya for checkups and vaccines. Two families in Manila composed mostly of women and children hold gifts from MCGI as they spend the eve of December 31st on the corner of Pedro Gil street. Also among the recipients was a 70-year old man who came to Manila in 1955. He has been roaming the streets of the Philippine capital ever since. The old man was very thankful for the “blessing” he received. “Would a rich family who spends PHP 100,000 on fireworks in a single night be willing to give it to the poor?,” was a question that Bro. Daniel posed during the Repaso 2012 coverage on UNTV. 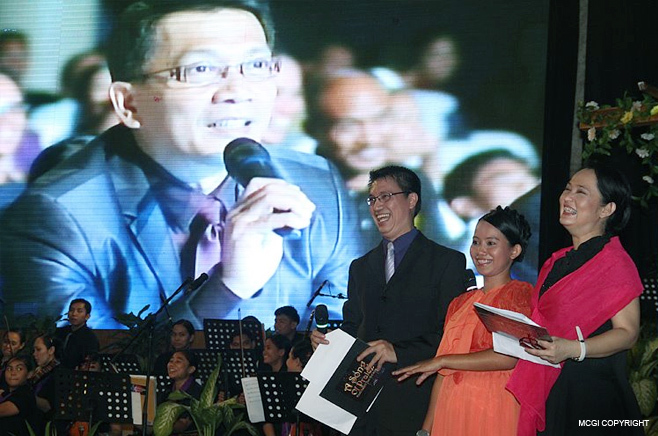 The veteran broadcaster is known in the country as “Kuya Daniel” for his various public service initiatives. Apart from campaigning against public use of fireworks in new year celebrations, Kuya Daniel urged viewers to instead use the money to help others, like by giving food. This is the same principle that Bro. Eli has been booming in his Bible Expositions, The Old Path (Ang Dating Daan) program, and even on social media. 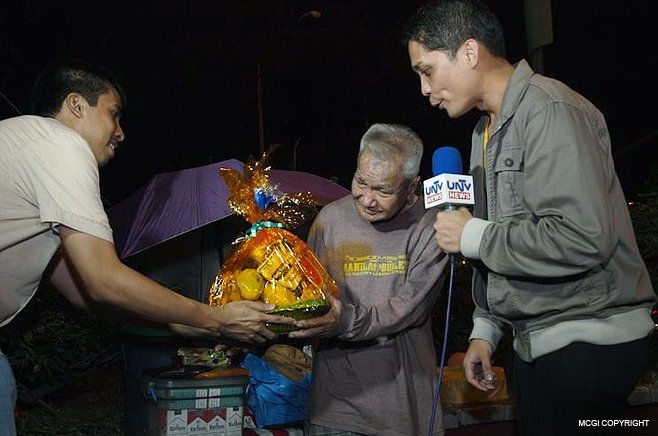 Alone on a pavement of Roxas Boulevard during the New Year celebration, an old man accepts the gift from MCGI and UNTV. 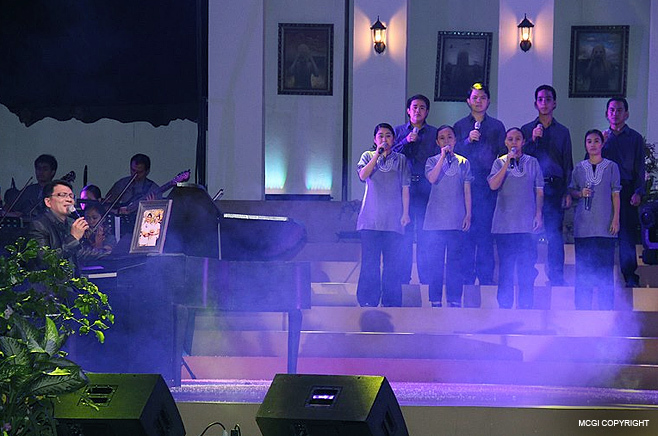 Capping 2012 with new songs of praise, the “A Song of Praise Year-End Finals” on December 25 last year yielded better entries than the Mid-Year ASOP Festival in July of 2012. 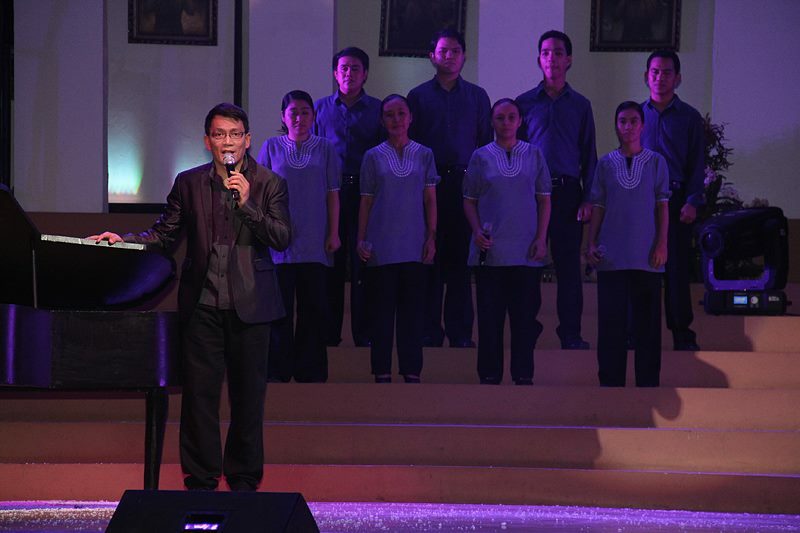 The Presiding Minister to the MCGI also commended the program and presentation of songs. The songwriting competition was held at the ADD Convention Center in Apalit, Pampanga. Bro. Eli Soriano congratulating the winners of the A Song of Praise Music Festival 2012 Year-End Finals. 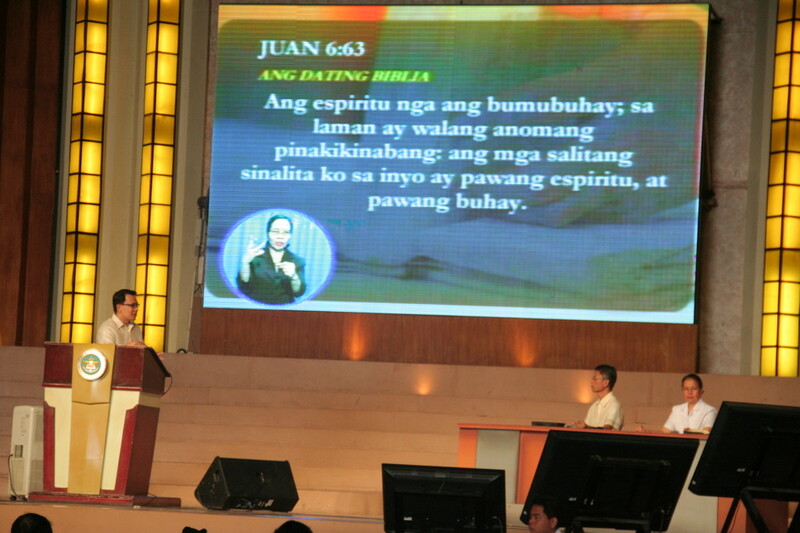 ASOP’s much awaited segment was the part when MCGI Leaders gave comments after each song was presented. “Wordy” became the word of the night as Bro. Daniel critiqued the ‘compacted’ structure of the choruses’ lines. He stressed the importance of writing a chorus, that it should contain a song’s most crucial musical lines. What also makes this songwriting festival unique is that comments are accompanied by suggestions on how the lyrics can still be improved. As in most of this edition’s entries, it was their choruses’ lyrics that Bro. Eli made minor changes to, with the composer’s indulgence. 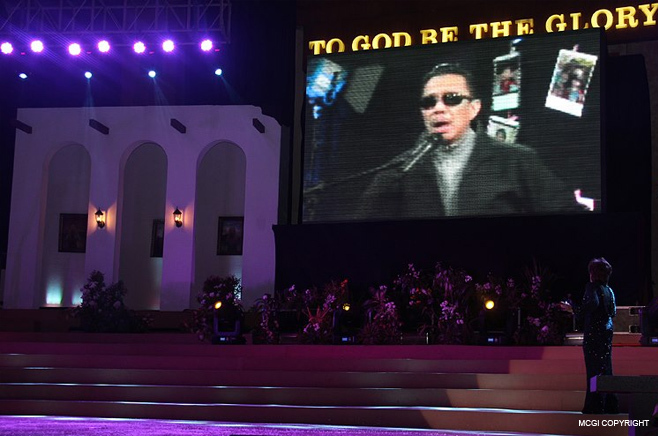 Other pieces of musical advice the Vice-Presiding Minister to the MCGI gave included proper choice of words, intended audience, and music length. He has composed several songs in the past; some of which have been rendered by popular Filipino artists like Jed Madela and Richard Reynoso. Also a songwriter himself, Bro. Daniel shared his songwriting technique where he starts with a song’s chorus first, making it easier to develop the other parts. He noted however that the ‘build-up to the chorus’ is highly important as well. Composers and lyricists also hear comments to their song from singer-songwriter Bro. Daniel Razon. For his part, Bro. Eli did ‘live editing’ of the choruses. Since most of the songs had lyric-length issues, he would request interpreters to repeat the chorus applying his suggestions. Bro. Eli voicing his thoughts on how to properly end a chorus melodically speaking. In the end, the MCGI Leaders added another line to the song entry’s chorus completing it. The Ang Dating Daan (The Old Path) host even wished that he had time to talk with the composers and see their work before the event. However, his regular Bible Expositions in different languages and time zones and other responsibilities make him unavailable for the endeavor. After some words were omitted and a few notes changed, the songs’ choruses ended up with an easier singing and listening experience. The crowd gathered at the Convention applauded as they heard the song’s improvement outright. Two songs were awarded Song of the Year-End with a score of 94.7%. Sharing the title were Ang Una Kong Pag-ibig (My First Love) from South Korea and Walang Kasing Tamis (Nothing Sweeter) from the National Capital Region. Bro. Eli also expressed his appreciation of all the singers’ interpretation of the songs. He remarked however that ASOP is not about the way the songs of praise were sung, but how they were crafted. Apart from musical standards, the song’s lyrics must be biblically sound according to Bro. Eli. For the complete list of winners, please see here. Thousands of global congregants of the Members Church of God International (MCGI) took part in the three-day International Thanksgiving of the quarter last December 22 to 24, 2012, which again marked another fruitful gathering of grateful hearts. 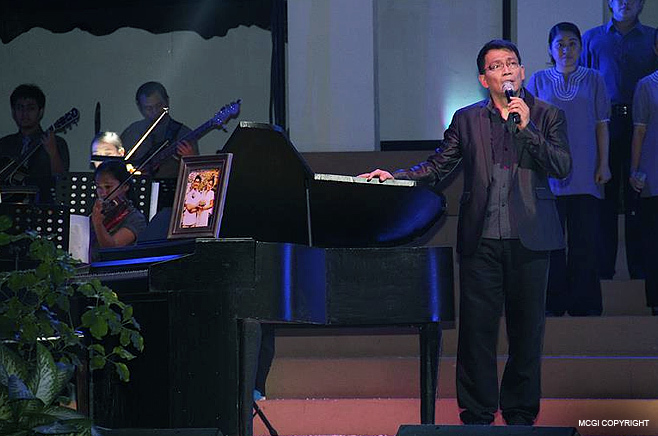 After the conclusion of the Thanksgiving, which is also called Pasalamat ng Katawan (Thanksgiving of the Body), at around 4 p.m. on the 24th, a special concert for the family was held at around 8 p.m. 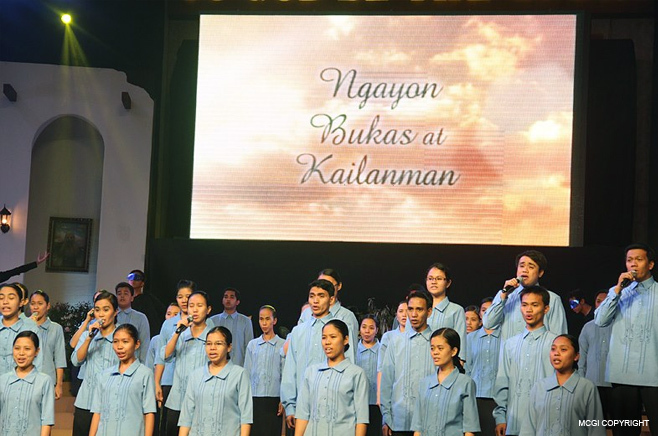 The concert billed as Ngayon, Bukas, at Kailanman (Today, Tomorrow, and Forevermore) was aimed at raising funds for the construction of a bigger convention center in the National Capital Region, Philippines. With presence in six continents, the Church of God International has major coordinating centers in North and South American countries, Europe, Africa, Asia, and Australia, among many other regions in the map. While majority of members are Filipinos, new brethren who are nationals of countries abroad are also growing in number. This was the result of the Church’s ongoing global evangelization initiatives, especially through the launch of programs catering to the Spanish- and Portuguese-speaking population. As expected, the three-day quarterly thanksgiving gathering teemed with topics prepared by Bro. Eli Soriano. Topics that were discussed before the members include the biblical wisdom that can be gained from looking beyond merely the tangible things on earth and another one about the benefits gained from understanding the secret of concealed prayer. Using the Bible as basis, MCGI Leaders Bro. Eli and Bro. Daniel Razon also debunked beliefs about predestination to hell and showed how the Lord Jesus used the Scriptures to teach truths. Bro. Eli also entertained questions from members and guests alike through the Consultation segments. While others take breaks, those who have questions about the topic or about a verse in the Bible may ask the International Evangelist during Consultations. Representatives from the different regions and ministries were given time to present their Thanksgiving offering as well as brethren from the different coordinating centers worldwide who shared their Thanksgiving greetings through canned videos and live streaming. The whole congregation offered their Thanksgiving songs during the second day while members from South America and Bro. Eli’s household presented theirs on the third day. The Thanksgiving gathering was punctuated by the special concert prepared by Bro. Eli and Bro. Daniel a few hours after the culmination of the International Thanksgiving. In the said program, a showcase of dance numbers, short musicals, and a variety of popular songs from the early 1960’s and mainstream 2012 were the night’s highlights. 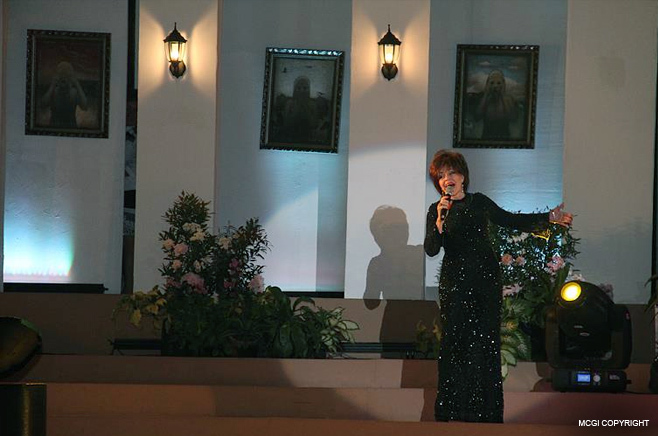 Asia’s Queen of Songs, Ms. Pilita Corrales came to perform some timeless Filipino love songs together with Bro. Eli and Bro Daniel. A short film dubbed as “Ngayon, Bukas at Kailanman” (Today, Tomorrow and Forevermore), conceptualized by Bro. Daniel, was shown as clips before every new song was played. This event serves a more noble cause other than just entertainment and fun, as how all other projects by the two leaders of MCGI are designed. Each year is a period of toiling and hard work for the Church and its members. Looking back at the fruits of their labor and recounting what have been accomplished and what blessings were received, MCGI gave thanks for the year that was.